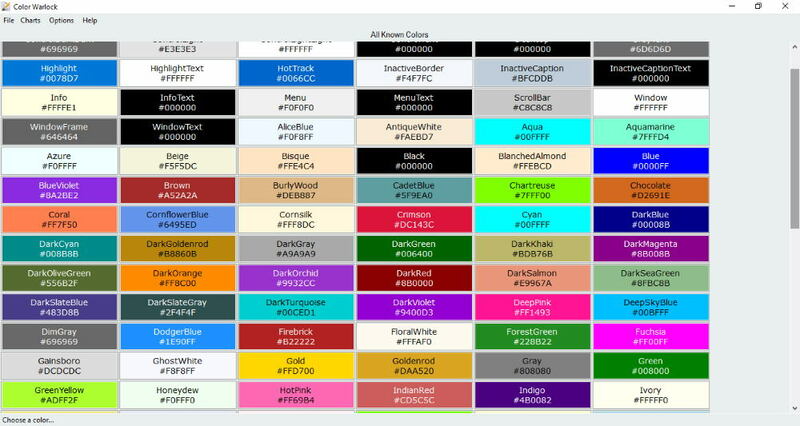 In this article, I have listed Best Free Color Palette Generator Software For Windows. If you are a graphic designer, this article is going to be a beneficial one for you. Download and install these software and start creating your own personalized color palettes. In all of these color palette generator software, you can add a different number of colors to color palettes. As you read the article, you will also find some freeware which let you create color palettes with a greater number of colors. I don’t know what is the actual limit to add colors to color palette for such software, but I successfully added 70+ colors to a single color palette. While reading the article, you will analyze that different techniques are used in different software to generate colors. You can create colors with the help of RGB sliders, color wheel, hexagon color palette, etc. After creating a color palette, you can save it either on your PC or in the software internally. SE-ColorMaker is my favorite color palette generator software for Windows. It comes with a color wheel, which offers a hassle-free feature to create color palette. What is the unique feature in this software? You can vary all the colors of a color palette in some definite proportion with respect to the main color. Read the article to know more about this free color palette generator. You can also go for Color Warlock in place of SE-ColorMaker. It also offers great features to create color palette. The unique feature of this software is that you can create 6 different shades of the same color, which follow the sequence of dark to light theme. To do this, you just have to select the start and end colors. You may also like some best free Color Inverter, Color Picker, and Coloring Book Software for Windows. SE-ColorMaker is a great color palette generator software. It is actually a multipurpose software which features Palette Editor, Color Editor, and Color Picker tools. The Palette Editor section provides you a feature to edit each of the existing color palettes or create a new color palette. You can create multiple color palettes in its Palette Editor. Initially, it displays the Palette Editor to edit the default color palette. You can edit that palette or make a new one by clicking on Palette > New Empty Palette. Now, click on Plus icon to add new colors to your color palette and on Minus icon to remove any of the added colors. Every time you click on the Plus icon, a new pointer is added to the color wheel, moving which, you can change the color of the respective color box in a color palette. You can edit the colors in color wheel in two modes: Lightness mode and Saturation mode. The best part of the software is that you can add a large number of colors to a single color palette. I don’t know the exact number for that, but I successfully added more than 70 colors in a color palette. In every color palette, there is one main color which cannot be deleted. So that you can vary all the colors in a color palette in some definite proportion, this main color feature is added to the software. You can change the main color either in the Palette Editor or in the Color Editor of the software. 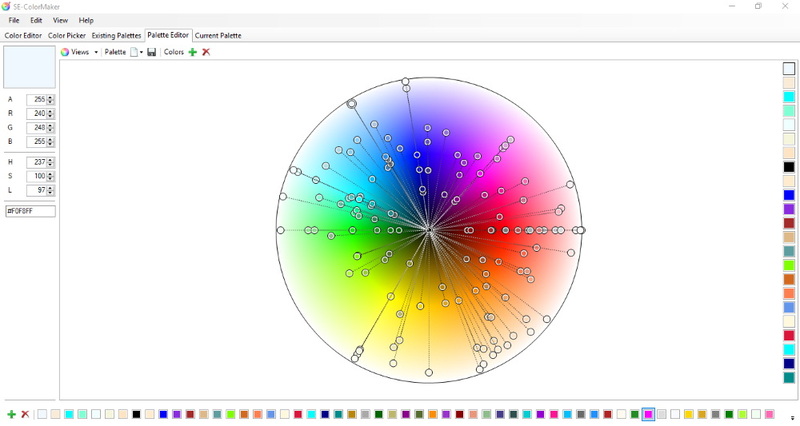 The Color Editor provides a maximized view to edit the main color. Here, you can vary the main color more effectively and accurately. It lets you save the entire palette on your PC in the PaletteTransform format so that you can continue from your last edited color palette in Palette Editor. Its Current Palette section displays all colors separately. In this section, you can edit an individual color and save it in ini format on your PC. Color Warlock is another great color palette generator software. It comes with some built-in color palettes, which are categorized as System Colors, Non-System Colors, All Known Colors, MS Office Colors, and Web Safe Colors. You can access all these color palettes in the Built-In section of Charts menu. Besides this, three custom color palettes are also available in the software, namely, Misc Colors, Random Colors, and Standard Crayola Crayons. All the custom color palettes created by you are added in the Custom list automatically for easy access. Do note that you can edit only the custom color palettes or the one which you have created. The software does not allow you to edit the built-in color palettes. Go to File > Chart Builder – New in order to create color palette. Fill the empty fields (Name of chart, Author of chart, and Website of Author of chart). Here, you will get two sections to build colors for your color palette: Basic and Blend. Basic: In this section, you can create a color by varying RGB patterns with the help of their respective sliders. When you are done, click on Add to Chart button to add the created color to the color palette. Blend: In my opinion, this is an advanced feature of the software. Here, you can create a chain of 6 shades of the same color following dark to light pattern. You just have to select the start and end colors. I am not sure about the maximum limit to add colors to a color palette, but I successfully added 70+ colors to a color palette in this software. You can save the created color palette in XML format on your PC. For all colors, different codes are provided, which include HTML HEX, CSS Value, HSL Value, RGB Value, etc. Out of these color codes, the display feature is available only for HEX color code, but copy feature is available for all color codes. It also has an additional feature by which you can define three different color codes to be copied on all three mouse clicks (left, middle, and right). ColorPic is a free color palette generator software for Windows. With this software, you can create multiple color palettes and save them. 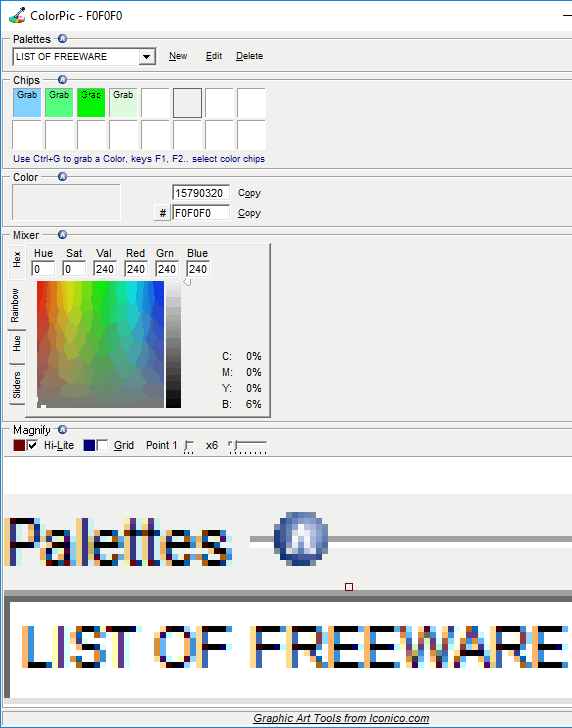 The saved color palettes are only accessible in this software as they are not saved on your computer. ColorPic also has some predefined color palettes, which can be edited by the user. Each color palette (new or predefined) contains 16 boxes. It features four views of color editor tool: Hex, Rainbow, Hue, and Sliders. You can create new colors in any of these views. In order to add colors to a color palette, you first have to select an empty box in the color palette. After that, the color you create will be added automatically to the selected color palette. For each of the above-listed color editor views, six variants are provided, namely, Hue, Sat, Val, Red, Grn, and Blue. The value of these variants changes with respect to the color selection. By copying these values, you can directly copy the generated color in any drawing software, like Microsoft Paint, Paint.NET, etc. Apart from this, the software also generates two types of color codes: Hex Color Code and WebSnap Color Code. You can also copy a color by copying its respective color code and pasting it in the drawing software. ColorMania is another free color palette creator software. It lets you generate a color palette of 6 different colors at a time. In order to generate different colors for a color palette, a color editor tool is provided in the software. This color editor tool comes with two features, using which you can invert the colors of a color editor tool and generate any random colors in it. Besides this, you can also choose any custom color from a color sheet which can be opened by clicking on Dialog button. You can also vary a color with the help of RGB and HSV sliders. When you are satisfied with the generated color, you can add it to any of the 6 blocks of your color palette. To do this, simply click on the button provided just above the block in the color palette. By following these steps, again and again, you can fill all 6 blocks of the color palette. For each color, it generates different color codes supported by different software. These color codes include HTML Hex, Delphi Hex, VB Hex, C++ Hex, RGB Values, RGB% Values, Photoshop, Powerbuilder, etc. After generating a color palette, you can save it on your PC in plt format. Color Bug is another useful color palette generator software for Windows. You can create your own color palettes or use the existing ones. It comes with three pre-defined color palettes, namely, Standard, Windows, and Tango. Click on the Color Palette icon on the icon bar to create a new color palette. You can use either HSL (Hue, Saturation, and Lumination) or RGB (Red, Green, and Blue) color coding techniques to create new colors. In both of these techniques, colors are created by varying the respective sliders. Besides this, you can also add colors to your color palette by picking any color from your screen. Drag the camera to the screen feature is provided for this purpose. After you create a color, simply drag and drop it to your created color palette. It does not have an option to save the created color palette on your computer. All the created color palettes are saved in the software automatically. You can access all of them in the Drop Down menu. Palette Generator is a free Windows 10 color palette generator app. It features 6 different modes to create a color palette, namely, Smooth, Accent, Varied, Crazy, Hue Shift, and Random. In each of these modes, every time you click on Generate button, it creates six different colors in a palette. 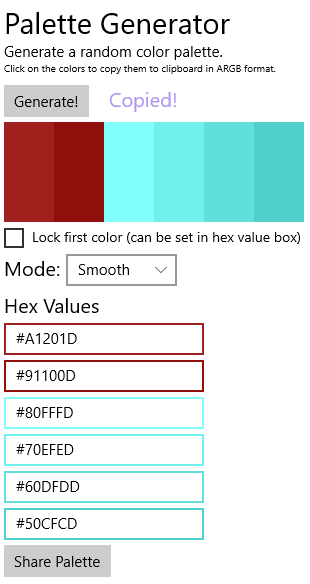 You can copy a color from the color palette by copying its respective HEX code thus generated. If you enable Lock First Color feature, the first color in the color palette will remain unchanged until you unlock it again. An option to share the generated color palette is also provided in the software, but it didn’t work while testing. Moreover, Palette Generator app doesn’t have a save option.